It’s been a busy first quarter for the Plater Bio Team. In late January they attended the World's Leading Trade Fair for Horticulture, IPM Essen in Germany. 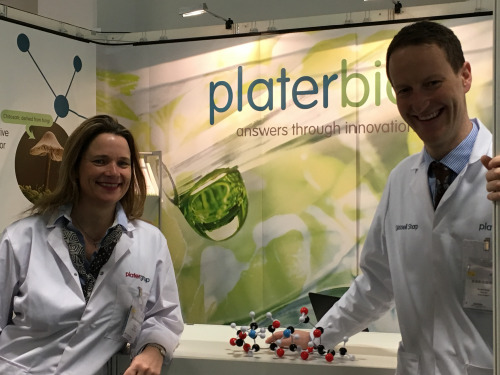 Plater Bio joined 1,564 exhibitors from 45 countries across the 14 halls to present new products and innovative technology. A week later and the team were setting up the stand at the fresh produce trade show, Fruit Logistica in Berlin. During the exhibition more than 3,100 exhibitors from over 80 countries presented a comprehensive market overview and click here https://www.youtube.com/watch?v=9MVaME3W_w8 to watch a tour of the halls. Plater Bio founder, Dr Russell Sharp has been very pleased with the response from potential worldwide customers and comments, ‘everyone who visited our stand was very interested in our revolutionary 'one part' hydroponic fertilizer and our range of natural extract based products, including cold-press seaweed and fungal chitosan’, he adds ‘we are really excited to be exhibiting next week at China International Agrochemicals and Plant Protection Exhibition (CAC) being held in Shanghai New International Expo Center, the largest agrochemical exhibition in the world. To find out more information about our innovative biostimulant and micronutrient developments contact Russell at sales@platerbio.co.uk and look out for news from China.